Maeve Conlon's life is coming apart at the seams. Her bakery is barely making ends meet, and one of her daughters spends as much time grounded as the other does studying. Her ex-husband has a new wife, a new baby, and a look of pity for Maeve that's absolutely infuriating. Her father insists he's still independent, but he's slowly and obviously succumbing to Alzheimer's. And now, her cousin Sean Donovan has been found dead, sitting in his car in a public park in quiet Farringville, New York, shot through the head. There was never much love lost between Maeve and Sean and she's not exactly devastated by his death, but suddenly the police are poking around asking the family questions. It's just one more hassle Maeve doesn't have time for, until she realizes that her father, whose memory and judgment are unreliable at best, is a suspect in the murder. Maeve is determined to clear his name, but is she prepared to cope with the dark memories and long-hidden secrets that doing so might dredge up? 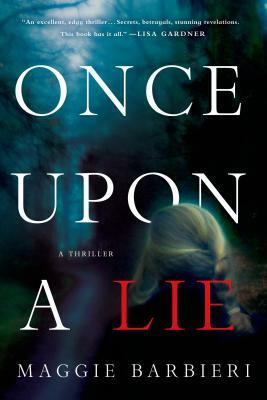 Maggie Barbieri will mesmerize readers with Once Upon a Lie, a gripping novel about family, justice, and the choices we make that define who we are.